This Florida-specific "Application Form for Veteran's Preference" is a document released by the Florida Department of Veterans Affairs. 4) A Veteran of any war who served on active duty during a wartime era. (5) The unremarried widow or widower of a Veteran who died of a service connected disability. 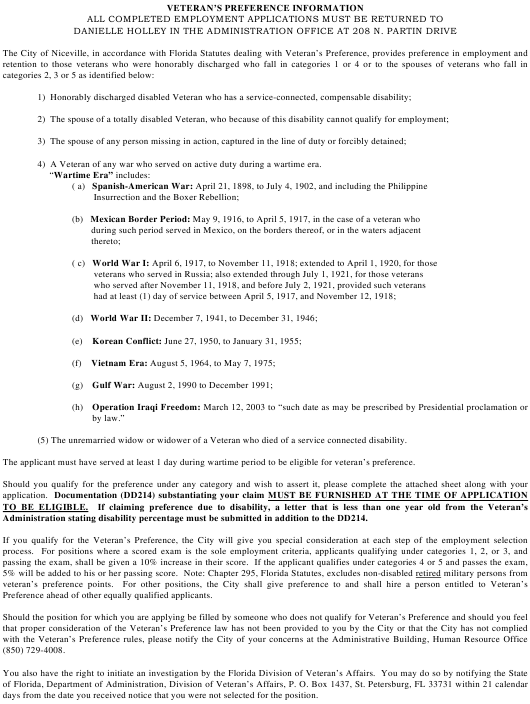 The applicant must have served at least 1 day during wartime period to be eligible for veteran’s preference. Administration stating disability percentage must be submitted in addition to the DD214. Preference ahead of other equally qualified applicants. days from the date you received notice that you were not selected for the position. form or equivalent certification from the Veteran’s Administration to their completed employment application. The unremarried widow or widower of a Veteran who died of a service connected disability. information as it pertains to their spouse). Did or does the Veteran have a Veteran disability rating from the VA? Have you received/asserted a Veteran’s Preference when applying for any job after October 1, 1987? Have you received employment after October 1, 1987, as a result of asserting Veteran’s Preference? noncompliance with the Veteran’s Preference laws.